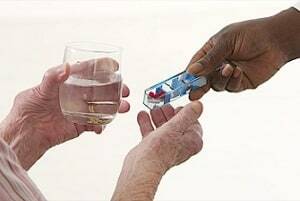 Because patients in nursing care settings are in a weakened state, their medication intake must be carefully monitored and supervised to avoid harmful side effects. Any unsupervised or unmonitored increases in dose or changes in medication are extremely dangerous to the patient. Medicinal abuse is the use of physical or chemical restraints or psychological medication for any purpose that has not been expressly authorized by a physician. Often, the medication given is a sedative used to calm the patient to prevent complaints and generally make the patient more agreeable. This serves the nursing home's purpose of keeping order which they generally prefer even at the price of turning their patients into lethargic zombies. It is just easier to quiet demanding patients with medicine, usually in high dosages without adequately monitoring for the dose-responsive side effects. The unsanctioned or improper administration of sedatives or other non-prescribed medications is rampant. In some cases, patients are prescribed anti-psychotic medications just to keep them drowsy. Another problem that is becoming more clear is the connection between opioid use and strokes in nursing homes. The reality is that nursing homes sometimes have a silent co-conspirator in these types of cases: the family of the patient. Sometimes, the family prefers a zombie of a parent or spouse than having to deal with the real thing. People reading this are not the type. But we all know they are out there neglecting those they claim to live. Let's talk about someone else right up front. Most lawyers -- us included -- front the expenses in nursing home injury and wrongful death cases. We can spend upwards of $100,000 just putting the case together. The risk of losing that money is borne by our law firm. So, regrettably, we simply cannot take cases that do not involve serious injury and death. But there are medication abuse cases that lead to bedsores, dehydration, malnutrition, and pneumonia that do lead to lawsuits and significant verdicts and settlements. There are many cases we see where we know the nursing home or the doctors did something wrong. But the economics do not allow us to proceed. But there are, as we will discuss, things you can do if you, your parent, or loved one is being given excessive medication even if you do not have access to the civil justice system. An agitated patient -- which is defined pretty loosely in the nursing home environment - is intravenously given a sedative or anti-anxiety medication by a staff member without a physician’s approval because the staff member has grown frustrated with the agitated patient. A patient complaining of pain is given a large dose of narcotic medication without the doctor’s authorization because the staff was tired of the patient’s complaints. A staff member, wishing to take a nap during his nighttime shift, gives sleeping medication to a patient without a doctor’s approval. Why? To get the patient to fall deeply asleep so the staff member can take a nap (or whatever else). Chris is 91 years old and suffers from dementia. Sometimes, when his dementia acts up, he can become very hostile towards those who are trying to help him. Knowing this and unable to deal with it, Chris’ family has decided to place him a nursing care facility outside of Baltimore that has a great reputation. Chris’ family is told that Chris will receive individual attention from sensitive and highly responsive staff members who are trained to help the elderly. Assured that the nursing home is a safe place for Chris, his family admits him there. Chris moves into a room on the facility’s fourth floor where Cara is his night time nurse. Cara just got over a huge breakup with her boyfriend and has been sulking around the facility lately. Nobody has seemed to notice. One night, Chris’ dementia acts up in the middle of the night and, confused, he starts screaming at the top of his lungs for help. Cara comes in and assures him all is fine, but ten minutes later the screaming starts again. Cara, already distracted with her personal life, becomes more frustrated with Chris and decides it would be best to administer some Ativan (an anti-anxiety medication), which has not been prescribed by the doctor, to Chris to get him to fall asleep. Ativan is counter indicated for some patients with narrow-angle glaucoma and it causes Chris to lose his vision. If you are getting bad care, speak up early and often. Be professional. Be appropriate. But speak up and let your concerns be understood. They are going to tell you they are going to fix the problem. But inspect what you expect. Make sure things have changed. Nursing homes often grease the squeaky wheels. Be kind, fair and measured in your dealings with the nursing home. But also be squeaky. Know what your rights are. In Maryland, this is a nice handout that explains your rights and how to complain when care is lacking and you have to go above and beyond just complaining to the nursing home. Know the law. You can find some key nursing home regulations in Maryland here. Michigan: $4,850,000 Verdict. A patient in a nursing home was given massive doses of various narcotic medications include morphine, Vicodin and fentanyl. Only the Vicodin had been approved by the physicians, but the staff administered the other, stronger narcotics whenever the patient became disruptive or combative with staff. The patient later died at the nursing home of a morphine overdose. 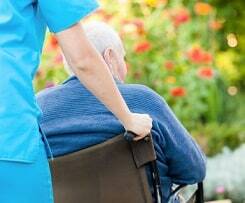 The patient’s family sued the nursing home and its staff for medicinal abuse. Texas: $1,250,000 Settlement. A 91-year-old female nursing patient was physically restrained for 55 days and drugged with another patient’s sedative medication to keep her from complaining and resisting. As a result, she suffered serious emotional distress and endured general physical weakness that caused her to lose her balance, fall and suffer severe injuries from these falls. Victims of medicinal abuse and their families have been through a lot and deserve an attorney who is both experienced and dedicated. The attorneys at Miller & Zois have a proven track record of success when it comes to serious injury and wrongful death nursing home cases. If your loved one was the victim of some form of medicinal abuse while a nursing home resident, please contact us today at 800-553-8082 or get a get a free case evaluation online.